Our Brother Lee Vayle was born on September 28, 1914 and joined the saints beyond the curtain of time on June 22, 2012. Like Brother Branham he was formerly a Baptist minister and in 1957 the Prophet described him as "another Baptist that's got the Holy Ghost." After baptizing him in the Name of our Lord Jesus Christ on July 17, 1963 and before he preached "Paul, a Prisoner of Christ," Brother Branham accredited him as "a very fine scholar and wonderful man." He often introduced and spoke of him from the pulpit as "my good friend Dr. Lee Vayle," and commended him to those who sought clarification on the Message. Brother Vayle grammarised the Prophet's teachings on the Seven Church Ages which were subsequently published in the book "An Exposition of the Seven Church Ages." Brother Vayle was a good man faithful at his post of duty and will be missed by many. He ran his race well, fought a good fight and finished his course. In less than a year this holy convocation may be over and the saints will all be reunited; so for we who are Spiritual this is joyous news, and a wonderful sign as the Pentecostal saints must enter via the gate called death. I believe the passing of this servant of God is an indication of the closeness of the end of the Gentile dispensation. "Precious in the sight of the Lord is the death of His saints". Sunday July 8 will mark Pastor Youcef Nadarkhani's thousandth day of incarceration on the invented charge of apostasy, however the good news is that he has been granted a new trial on September 8 which is likely to overturn his conviction and restore him to family and Church. Please remember our Brother in your prayers. Our main article, "Son of Man, Son of God, Son of Man, Son of David," is a revision of our exposition on these four major dispensation claims of Jesus Messiah, rightly dividing His Offices of Prophet, Priest, and King, the restoration of apostolic faith to Christ's end-time Bride and reconfirmation of the New Covenant to Israel prior to the consummation and Kingdom. We must possess a clear understanding of these rudimentary facts. Please read carefully and prove all things in your own Bible as the hour is late and it is unlikely that we will be able to revisit this subject. June 26, 2012  On Tuesday, June 26 Belgium time the North Atlantic Council, the highest governing body of the US-dominated North Atlantic Treaty Organization military bloc, will take up the issue of Syria under provisions of its founding document that in the past ten and a half years have resulted in military deployments preparatory to and the subsequent waging of full-scale wars. The ambassadors of the alliance's 28 member states constitute the council, nations whose collective population is 900 million. Its founding members include three nuclear powersthe US, Britain and Francethe first the self-proclaimed world's sole military superpower. Until the day before the meeting NATO was to take up a request by member Turkey to hold consultations under the terms of the North Atlantic (Washington) Treaty's Article 4, which allows any member state to call on the entire alliance to respond to alleged threats to its territorial integrity and security. On June 25, three days after a Turkish F-14 supersonic fighter-bomber was shot down over Syrian waters, Turkey announced that it was going to ask the military alliance to discuss its Article 5, which states that "an armed attack against one or more of them in Europe or North America shall be considered an attack against them all" and commits NATO allies to "assist the Party or Parties so attacked by taking forthwith, individually and in concert with the other Parties, such action as it deems necessary, including the use of armed force. . ."
On June 25 Turkish Deputy Prime Minister Bulent Arinc announced that his nation "has made necessary applications with NATO regarding Article 4 and Article 5." "It should be known that within legality we will of course use all rights granted under international law until the end. This also includes self-defense. This also includes retaliation many-fold. This includes all sanctions that can be applied to the aggressor state under international law. Turkey will not leave anything out on this issue..."
The US and NATO have been itching for a pretext to attack Syria, and Turkey, the only NATO member to border the country, has always been the pretext which would be employed to justify military action against the Arab nation. Comment: Like Saudi Arabia, Britain and the USA, Turkey is Jewish-ruled. A new poll by the Ankara Social Research Center shows that more than two-thirds of the Turkish people oppose intervention in Syria, despite the recent shooting of two Turkish military planes over Syrian waters. WikiLeaks has begun publishing more than 2 million emails from Syrian political figures that it says will shed light on the regime's crackdown on dissent and embarrass Syria's opponents. "They also reveal how the West and Western companies say one thing and do another," the organization said. June 27, 2012  American-led imperialism has evolved from bloody bouts of episodic militarism over several decades to the present day state of permanent belligerence, with wars or war-making stretching from North and East Africa into the Middle East and Central Asia and beyond to Eurasia, the Far East and the Arctic. Of most immediate concern are the ongoing American-led war plans within the broader Middle East/Central Asian region involving coordinated actions against Iran, Syria and Pakistan. We are living in an era hallmarked by "The Globalization of War" conducted by the very states that proclaim to be defenders of democratic rights and international law. The chief protagonist of this globalized war is the United States of America. The US, along with its allies in the North Atlantic Treaty Organization (NATO), Britain, France, Canada and Germany among others, as well as an array of proxiessuch as the Persian Gulf Arab statesis now emboldened to strike militarily in any region of the world. War preparations to attack Syria and Iran have been in "an advanced state of readiness" for several years. US, NATO and Israeli military planners have outlined the contours of a "humanitarian" military campaign, in which Turkey (the second largest military force inside NATO) would play a central role. June 28, 2012  The NATO-backed covert aggression against Syria could be reaching a tipping point for all-out war involving state forces. That should be no surprise. For the past 16 months NATO and its regional proxies have been steadily increasing the violence and turmoil inside and outside Syria, while the Western corporate-controlled media maintain the ridiculous fiction that the bloody chaos is largely due to the government forces of President Bashar Al Assad cracking down on "peaceful protesters". Ironically, the crisis is culminating at the same time that the United Nations convenes an emergency summit on Syria in Geneva this weekend. The meeting, which is ostensibly aimed at "reviving the Kofi Annan peace plan," will be attended by the five permanent members of the UN Security Council and other "invited" regional states. The irony is that leading NATO members, the US, Britain and France, as well as their Turkish and Arab allies who will also be attending the crisis conference, are the very parties that have deliberately created the precipice for all-out war in the Middle East. As dignitaries fly into Geneva to "salvage peace in Syria," there is a lockstep military build-up on the northern and southern flanks of Syria underway, with news that Turkey has dispatched battlefield tanks, missile batteries and heavy artillery to its Syrian border, while to the south Saudi Arabia has announced that its military forces have been put on a "state of high alert". . . The military pincer movement against Syria tends to support the analysis that the downing of the Turkish fighter jet was a deliberate set-piece scenario designed to furnish a cause for war, or at least a stepping up of the international psyops campaign of intimidation against Syria. . . Considering the incendiary role of Saudi Arabia in Syria, and possibly the region's conflagration, the Saudi rulers should be summoned to a top seat at the "peace summit"to face the most withering questions about their warmongering, criminal interference in a neighbouring state. Then, using Nuremburg principles, prosecutors should proceed to arraign the rulers in Riyadh along with their accomplices in Washington, London, Paris and Ankara. Full story: globalresearch.ca. More STUPID and impossible lies by controlled media whores and US agencies. As to Pharisaic Talmudism in its present form, this is a rather late development, beginning in early medieval times, after the coming of the Khazars into Europe. Benjamin Freedman always called them "so-called and self-styled Jews." They are not the people seen in the Bible. They are not Semitic and certainly not Judean, but Judaism from AD1000 onward is almost entirely a Khazarian creation. Moreover, their ideology and their behavior are elitist and racist, just as we see in their apartheid ministate. Even with other Judaics, Khazar supremacism rules. This is emphatically why the Sephardim, the few remaining Karaites, Mountain Jews, Ethiopian Falashas, the Kai Feng of China, Torah True Jews and other Judaic minorities, do not get along very well with the snobby Ashkenazis, who act as if all the others are inferiors. Note that all the Judaic minorities mentioned are non-Talmudic sects. While treated a little better than Palestinians, they are definitely victims of prejudice and animosity in New Khazaria. Oops, I mean "Israel". Zionism has usurped and appropriated the Judaic religion for its own non-religious, basically atheistic, political ends. That being said, it does appear that the Talmud (extremist parts of which are openly anti-Christian as well as ethnocentric and racist) certainly seem agreeable with rather than disavowing such supremacist goals. Again, the voluminous contents of the Talmud are deceptive, diverse and obscure, requiring close examination, so we shall not go there in this exercise. The essentially atheistic Zionist founders and leaders use all of this to their advantage with unfortunate Jews who buy into the phony Pharisaic fairy tale that they are a specially and divinely chosen folk . . . examining today's Khazarian Zionist threat. . . In regard to that, never forget that the Zionist statelet has weapons of mass destruction, aided abetted and tolerated by the various world powers. . . If Christians follow the examples of the peaceful Palestinian prophet called Jesus, why do they support Zionist aggression? Shouldn't they repudiate these classic Pharisees as did their Messiah/Saviour? But even more in light of current events and a collapsing economy, why are billions of dollars in American tax money used to support this radical régime? But I am sure all my readers know, such seemingly simple questions are not only not unanswered, they are rarely even raised, and certainly not in Christian pulpits or the US Congress. Full story: From the Temple to the Talmud, Exploring Judaic Origins, History, Folklore and Tribal Traditions, by Harrell Rhome. What Really Happened in the "Yom Kippur" War? For me, the Yom Kippur War (as we called it) was an important part of my autobiography. A young paratrooper, I fought that war, crossed the canal, seized Gabal Ataka heights, survived shelling and face-to-face battles, buried my buddies, shot the man-eating red dogs of the desert and the enemy tanks. My unit was ferried by helicopters into the desert where we severed the main communication line between the Egyptian armies and its home base, the Suez-Cairo highway. Our location at 101 km to Cairo was used for the first cease fire talks; so I know that war not by word of mouth, and it hurts to learn that I and my comrades-at-arms were just disposable tokens in the ruthless game weordinary peoplelost. Obviously I did not know it then, for me the war was a surprise, but then, I was not a general. Vinogradov dispels the idea of surprise: in his view, both the canal crossing by the Egyptians and the inroads by Sharon were planned and agreed upon in advance by Kissinger, Sadat and Meir. The plan included the destruction of the Syrian army as well . . .
Before the war Sadat was at the nadir of his power: in Egypt and abroad he had lost prestige. The least educated and least charismatic of Nasser's followers, Sadat was isolated. He needed a war, a limited war with Israel that would not end with defeat. Such a war would release the pressure in the army and he would regain his authority. The US agreed to give him a green light for the war, something the Russians never did. The Russians protected Egypt's skies, but they were against wars. For that, Sadat had to rely upon the US and part with the USSR. He was ready to do so as he loathed socialism. He did not need victory, just no defeat; he wanted to explain his failure to win by deficient Soviet equipment. That is why the army was given the minimal task: crossing the Canal and hold the bridgehead until the Americans entered the game. Though the suspicions voiced by Vinogradov in his secret document have been made by various military experts and historians, never until now they were made by a participant in the events, a person of such exalted position, knowledge, and presence at key moments. Vinogradov's notes allow us to decipher and trace the history of Egypt with its deindustrialisation, poverty, internal conflicts, military rule tightly connected with the phony war of 1973. . . Thanks to the American takeover of Egypt, petrodollar schemes were formed, and the dollar that began its decline in 1971 by losing its gold standardrecovered and became again a full-fledged world reserve currency. The oil of the Saudis and of sheikdoms being sold for dollars became the new lifeline for the American empire. Looking back, armed now with the Vinogradov Papers, we can confidently mark 1973-74 as a decisive turning point in our history. July 5, 2012  According to a Wednesday article posted on antiwar.com, the FBI partially declassified and released additional pages from a 1985-2002 investigation into how a network of front companies connected to the Israeli Ministry for Military Affairs illegally smuggled triggers used for nuclear weapons (crytrons) out of the United States. The FBI investigation reveals that Netanyahu worked at Heli Trading Company, the Israeli node of the network during the smuggling operations. The Israeli premier was in contact with Richard Kelly Smyth, who at the time was president of the MILCO International Inc., a front company for the Israel-based Heli Trading Company, then owned by Hollywood producer Arnon Milchan. In April 2002, Smyth was sentenced to 40 months in prison and fined 20,000 dollars . . . Comment: Our dastardly mendicant ally. A subscriber writes: In regard to the London Olympics, when one considers the 100,000 troops that form a security that tells you that they are the cover just like the armed troops (police) employed at airports. Likewise the use of 'drones' as surveillance, or are they attack-capable vehicles? Last year Iran was able to take control of an American/Israeli drone in Afghanistan and land it in Iran to the displeasure of the Americans. Now suppose the drones over London were 'hijacked' and used against the general populace by 'terrorists.' It would be proclaimed that Iran had supplied this technology to the terrorists and thus guilty of the 'terrorist' attack: a casus belli for an attack on Iran. Just a thought remembering, "By deception thou shalt do war". June 27, 2012  A manic desire of the liberal-reformist is to have the whole of Russia's industry in "efficient private hands" . . . these privatisersthese are the enemies of Russia and Russian people, FREELY transferring the wealth of our country into the hands of outside shareholders, international Jonas. Putin and his Jewish organized crime group have seized power in Russia" and are privatizing national assets "to help the IMF and Europe in the amount of$10 billion. . . to buy collateralized debt securities in Europe and replenish the "granary" of the International Monetary Fund, which provides loans again . . ."
Comment: Russian president's chief-of-staff Sergey Ivanov on Eurozone crisis, protest movement in Russia and other issues dominating discussions. June 26, 2012  Russian President Vladimir Putin, who made a quick visit to the Middle East, arrived at the head of a large delegation to Israel, where he held talks with top officials of the Jewish state. In the ceremonies to mark his visit, Vladimir Putin was attended by "the chief rabbi of Russia," Berel Lazar, president of the Federation of Jewish Communities of Russia, Alexander Beard, and president of the Federation of Jewish Communities of the CIS, Lev Leviev. After the ceremony, Putin went to Jerusalem to meet with Israeli Prime Minister Benjamin Netanyahu, who was unable to come to Netanya owing to a leg injury. The negotiations at the highest level lasted about three hours and ranged from issues of bilateral relations and situation-ridden "Arab spring" the Middle East region. In the evening the Israeli president gave a large reception at his residence for the Russian delegation. In his welcoming remarks Peres stressed, "Russia's importance in the international community" and expressed confidence in "the continuation and strengthening of friendly ties between the two countries." Putin thanked the hosts for the invitation and assured those present that "peace and security of Israel was in the national interest of Russia." Comment: This confirms the news items in Newsletter 742. Like many of America's presidents and numerous popes, all of Russia's presidents have been Jews: Lenin (Ulyanov), Stalin (Josif Djugashvili), Khrushchev (Perlmutter), Gromyko' (Katz), Primakov (Finkelstein), Andropov (Lieberman). Gorbachev (Kahn), Yeltsin (Jelzman), Putin (second cousin to Yitzak Radoshkovich), Medvedev (Shaposhnikova). As far back as 1950, Dimitri Manuilsky, Russian delegate to the United Nations who succeeded Lenin as leader of the World Revolutionary Movement (Free Masons), spoke of "launching the most spectacular peace movement on record." Its objective was to "put the bourgeoisie to sleep," so that the final take-over of the entire world by the Communists would succeed through the element of surprise. This "peace offensive" was launched by Khrushchev in 1956, but passed largely unnoticed because of the dramatic diversion provided by de-Stalinisation. The vital importance of Khrushchev's speech at the Twentieth Party Congress was that it inaugurated the strategy of "peaceful co-existence" as the means of achieving world-wide Communist dictatorship an objective which clearly could not be gained by conventional military confrontation. Michail Gorbachev brought it to fruition, and the International Jews are funding it at US taxpayer expense through their tax-exempt foundations, and agencies such as the International Monetary Fund, UN and World Bank. Speaking to the Politburo in 1989 Gorbachev said, "In October 1917 we parted with the old world rejecting it once and for all. We are moving toward a new world, the world of communism. We shall never turn off that road." He also said "Gentlemen, comrades, do not be concerned about all you hear about glasnost and perestroika and democracy in the coming years. These are primarily for outward consumption. There will be no significant change within the Soviet Union, other than for cosmetic purposes. Our aim is to disarm the Americans and let them fall asleep." During 1989 when the Berlin wall came down (pre-planned to the day and hour two years in advance he proclaimed "I am a convinced Communist. For some this may be a fantasy but for me it is my main goal." (See Newsletters 344 and 607. "What we are not told is that the Plenipotentiary for the Constitutionally Special Status of Berlin (A Body of Public Law, Provisional Seat Königsweg 1 W-1000, Berlin-Zehlendorf 1), "forced, approved and called up for essential service by the Western Powers, had on November 15, 1987, in the Reichstag already announced the exact date the Wall would fall in 1989". As the traitor President Franklin D. Roosevelt, who allowed 2,403 servicemen to be slaughtered at Pearl Harbor to initiate America's entry into WWII said: "In politics, nothing happens by accident. If it happens, you can bet it was planned that way"). Rowan Gaither, president of the [Jewish-controlled] Ford Foundation, confided personally to Norman Dodd, Director of Research for the Reece Committee of the US Congress in 1953, "Mr. Dodd, all of us here at the policy-making level of the Foundation have at one time or another served in the 0SS [the Office of Strategic Services, the forerunner of the CIA) or the European Economic Administration, operating under directives from the White House. We operate under those same directives. . . . The substance of the directives under which we operate is that we shall use our grant-making power to so alter life in the United States that we can be comfortably merged with the Soviet Union." Noam Chomsky said, "People don't know what's happening, and they don't even know that they don't know." For instance, how many Americans are aware that all US Presidents from Woodrow Wilson have been Communists? Oh not saying card-carrying Party Members, but they were controlled by Zionists, and Jewish-led Think Tanks, like the CFR and Trilateral Commission that dictated their policies, which are all Communist in principle. Globalism and internationalism is Communism. Laodicea means Communism, which has already conquered the West as indicated above! The United States is already "comfortably merged with the Soviet Union," now the Russian Federation (Revelation 3:14-22). The military blueprints for World Wars I, II and III were established in 1871. As attested in your daily news, World War III will bring political Zion and political Islam into collision to emasculate both philosophies, once they have fulfilled their utility and cannot be permitted to interfere with Lucifer's totalitarian one world government (Ezekiel 38; 38; Daniel 11; Zechariah 12). Then in the second half of Daniel's Seventieth Week after Rome abrogates her covenant with Jewry, Communist Russia, which the Lord has raised up to destroy the false church will 'nuke' Vatican City State and the (once) Protestant United States of America and Armageddon will set in (Daniel 12; Zechariah 14; Revelation 16:13  18:20). I'd rather be living right now than at any other time in human history. We are grateful to the Lord to be living at the climax of human history, looking forward to the manifestation of the Sons of God, the greatest time of all just before the Lord takes His Church Home. While grace remains we should be checking up on our faith and examining our lives in the mirror of God's unchanging Word, asking "What do people see when they look at me? Does my life point to Christ the revealed Word, or a creed? Is my life worthy of the Gospel, do my actions reflect Christ and His Word, or myself and the world?" As the preacher once said, "Your life speaks so loud, I can't hear your testimony." If you believe, yet know you have not received the earnest of the Spirit which is the new birth, and you would like to be remembered in prayer now, so everything will be made right between you and God tonight, just raise your hand or say in your heart, "Remember me, Lord". Lord Jesus, we stand tonight between the living and the dead, knowing the lateness of the hour and seeing the conditions of society foretold in your Word being fulfilled before our very eyes; we pray that you'll bless every one of those requests. Tonight may their hearts go beyond belief to faith in your Word. Make the present Truth a reality to them Lord, and quicken their souls to obedience that you may live through their hearts and rule in their lives by love. In your dear Name we pray, Lord Jesus Christ. Amen! Christians stand in confidence before the very throne of God without condemnation, knowing we are the sinless, spotless Bride Jesus died to redeem to Himself, resting in what He did for us who were justified when He raised Christ from the dead and set Him above all principality and power, might and dominion, and every name that is named, and put all things under our feet because by the Marriage union we are one (Romans 8:28-30; II Corinthians 5:14-21). I Corinthians 6:17: "God and the soul that is joined together with God is one Spirit". God has such confidence in the believer He told His enemy, "My servant Job is so perfect, there's not another man on earth like him." Oh! If we could only be that kind of a man! That He can place such confidence in us, knowing we will not misplace or misuse His Word or His Being to justify ourselves. Christ's end-time Bride is growing into the stature of the perfect Man whom He can trust to operate His Word, and we are not alone. Two Hebrew prophets are being groomed to speak His Word with national and global repercussions. Job was a man who carried out God's commandments to the letterSatan knew that but said, "If You'll just let me have him, I'll make him curse You to Your face." So God told Satan, "He's in your hands, but don't you take his life." Satan went as far as he could. He could not take his life, but he took every friend, his children and everything he had. Still Job held right on, there was no turning back. When a person once comes in contact with the reality of God by a genuine, revealed faith that "God is," nothing, no time or circumstance can ever separate that man from his God. Paul said, "There's no strife, no hunger, no perils, neither living creatures, death, or anything that can separate us from the love of God which is in Christ Jesus." Peter said, "You have been born again, not by the perishable seed of your parents, but through the imperishable Seed of the Message of God, which lives and abides forever" (I Peter 1:23). Once married to Christ, there is no divorce, we are Word of His Word, securely anchored in Him because we were ordained to that Life (Genesis 2:23-24). Satan thought he could provoke Job to curse God. But Job with his perfect revelation of who God was and how God loved him, waited. No matter what the circumstances Job waited for his faith to be confirmed. Faith waits with patience for the promised Word to be fulfilled and Job held to God by revelation as Jacob wrestled with Him in the flesh. When you have the revelation you are "justified" in asking your request and believe that "He is a rewarder of those that diligently seek Him" nothing can separate you from that faith anchored in your soul. But it has to be revealed to you first and your motive and objective must absolutely be the will of God without a hint of selfishness. Intellectual faith is not sufficient, genuine faith is neither psychology nor emotions but absolute confidence in revelation. "If our heart condemns us not we have confidence towards God. And whatever we ask, we receive of Him, because we keep His commandments and do those things that are pleasing in His sight" (I John 3:21-22). In all of his trials Job was searching for the mind of the Lord. He was a prophet to whom the Word of the Lord comes and was sure he had followed every Word, instruction and revelation, certain he was walking in the Light as God was in it; the one thing he needed was for the inspiration to strike him. Notice, Job did not move from his revelation but waited for God to reveal the next stepfurther Light on the Word. If we prepare our hearts by walking in all the Light God has revealed to us in this day, follow Him in baptism according to Acts 2:38-39; follow Him in observing foot washing and the Lord's Suppernot "His breakfast or lunch," follow every Word He has revealed, leaving nothing aside; then we are ready for the quickening power of God. Just before the going-away God will pour out a latter rain that will quicken His little flock, then what we say He will do! Yes sir, there'll be a new wave offering. Not another sheaf but the finished Bride as represented in Leviticus 23 by two loavesthose who fell asleep and we who are alive and remain. The sleeping saints will resurrect Church Age by Church Age, and after a short and powerful demonstration of the Spirit in His end-time Bride we will change in the atoms and our little hunted and persecuted group will go to be with Jesus. How will this come about? It will manifest by overcoming the world through faith in God's Word. Revelation will wash away all unbelief, carnality and uncleanliness, then Christ will have preeminence in His saints. Job had the gift of bypassing the ten senses of his flesh and spirit for a clear channel of communication with God where reasoning, imagination, selfishness, pride, the world and the flesh could not impede inspiration. Having offered the burnt offering and fully obeyed in all things Job knew he was righteous and without condemnation, yet God was silent so he was also without inspiration. Still the Devil could not move Job from faith and trusting obedience in God's revealed Word. Let us not deceive ourselves. Have you relied upon some sensation like speaking in tongues or something you can do that Satan can impersonate? Maybe you have drawn strength from pleasing men by conforming to the line of a denominational or Message church. Satan is the sum of wisdom and beauty and can impersonate all manner of works but he is without faith and fails the Word test. The genuine Holy Ghost is the present Truth manifested in your life. If Christ is in you, you will understand the Message for your hour and receive the inspiration. Only the elected can recognize and live the present Truth whose revelation will pass right over the head of the non-elect. Election is simply God's foreknowledge of our free choice. Jesus thanked the Father that the inspiration is hidden from the wise and prudent and revealed unto babes as will learn (Matthew 11:25). When the inspiration struck Job, He knew and was sure It was God. Nobody could persuade him otherwise. It agreed with the rest of the Word and was his permanent possession. Job's inspiration came in a time of crisis such as we live in today. We should be in desperation to know the mind of Christ and that our lives are written epistles of the Word prophesied for this hour. That's the only way we can serve our Lord and the only way we will escape the tribulation that will destroy our world by fire as it destroyed the Gentile world of Sodom and Gomorrah. I was speaking today with an old minister. He follows the teaching of the late Dr. Ironside, who represented some of the many Brethren sects. He was telling me that the 144,000 elect Israelites will preach salvation to the Gentiles during the Great Tribulation and they will go into the millennium. However, no one will receive but multitudes will lose their salvation in those days, while 144,000 and all who are "saved" will be martyred. He has not recognized that Redemption is Over and has not seen the types of Noah or Sodom where all flesh was destroyed, for "they will be left neither root nor branch" when Christ and the saints of all Ages "step out on the ashes of the wicked" (Malachi 4:1-3). John the Baptist's prophecy in Matthew 3:12 agreed; the seventh angel prophesied those Gentiles who do not receive his Message of restoration will remain in unbelief (Revelation 22:9-11, 17-19) as did Daniel, Peter and Jesus Messiah (Daniel 12:10; Acts 3:21; Revelation 19:20; 20:5). God will not turn to Israel until the last elect Gentile is born-again (Romans 11:25). All of the 144,000 elect Israelites will be re-born in one day in the land of the Covenant and then be martyred by Jews and their Roman Catholic church so they will not minister to the Gentiles. When the Seventh Trumpet signals the end of the Gentile dispensation, an earthquake of unprecedented magnitude will send Los Angeles to the bottom of the ocean. The foolish virgin, Fifth Seal Israelites and other non-elect whose names remain in the Book of Life are already "saved," having made their decision during the day of grace to walk in all the Light they knew, but not being born-again they will enter the Great Tribulation and be martyred for their testimony. Beware of kindly old men who love the Lord, know the "letter" of His Word like the back of their hand but preach against the revelation. Paul called them spiritual bastards who prove God is not their Father when they refuse correction by His Word (Hebrews 12:8). Like the Pharisees whom Jesus rebuked in John 8 these sincerely misguided nominal Christians, are angels of a false lightfallen angels, reprobate concerning the faith, deluding themselves they are Christians and ministers when in fact they are religious seducers. Don't imagine you can reject today's Message and hope for a second chance in the Great Tribulation (John 3:18; Acts 3:23). If you hear this Message and reject it you have rejected the Holy Spirit. Curse these false ministries and get into Christ now. Don't dare believe old ministers who look you in the eye and quote God's Word but deny the faith. This man wrote a tract scoffing at the gifts of the Spirit, notably speaking with other tongues. He gave no Scripture but the tongue of bad report in support of his 'revelation.' He may have scorned the Giver rather than the Gifts (II Peter 3:1-7). Certainly much of what we see is flesh and not of God, but those Gifts will be in the Church so long as she is on earth. There is a dearth of righteousness in the world: greed and self-seeking rather than service and the commonweal are the motivation of far too many public faces; laws are framed to favor the guilty, morals are perverted, churches are apostate and know it not, there is no certainty even in preparing for a career as knowledge is often superseded as it is taught and employment opportunities may be expatriated tomorrow. Material security is threatened as inflation, predicted to become hyperinflation, devalues fiat currencies and depression threatens to devalue real property. Instead of measures to protect the commonweal, our puppet governments strive to preserve banking interests whose fraudulent fractional reserve system is the root of all evil. Society has rejected the Absolute; their only constant seems to be more change. Isaiah said, "When the enemy comes in like a flood, the Spirit of the Lord will lift up a standard against him." In this gloomy hour in which there is no clear distinction between day and night, right or wrong, in either church or society, God sent the certain Light of THUS SAITH THE LORD in the evening time (Zechariah 14:7). We are at the end of the Gentile dispensationno one will be "saved" during the tribulation. Jesus said when the Seven Seals were opened there would be no further delay for intercession as all seven Church Ages of PART Word would be fulfilled (Matthew 25:1-13; I Thessalonians 4:16; Revelation 10:6; 18:4). Let us have our lamps trimmed and filled with oil so we can see where we are walking in the Word. In response to the midnight cry of Malachi 4:5-6 all ten virgins will "come out" of Rome and her harlot (once) Protestant daughters, whose destiny is the lake of Fire (Revelation 2:21-23; 19:20; 20:5, 10, 15). All ten virgins are "saved"; the five wise are born again and will be translated before the tribulation, while the "foolish" will be cast into "outer darkness" but granted into eternal Life at the White Throne Judgment. Like Christ's end-time Bride, the elect 144,000 of Israel were fully redeemed in Christ on Calvary. Luke 17:30: "As it was in the days of Lot, so will it be in the day when the Son of man is being revealed." To reveal is to make known a secret, and Jesus promised the mystery of God should be finished by the seventh angel's Message calling His Bride out of Babylon (Matthew 25:6; Revelation 18:4). Not in the days of Luther's Message, or Wesley's, or what the Pentecostals had (which was only the restoration of the Gifts). At every dispensation change the majority is so bound by church traditions it is impossible for them to recognize the Light for the new Age, being convinced that their denomination has all of God. It has always been that way and only the elect minority will see it. Paul saw this at the very start of the age of grace; he said the Israel nation was spiritually blind but according to the election of grace a remnant of individuals would catch the revelation and enter into Christ (Romans 10-11). Isaiah foresaw Israel at the end of their dispensation with "eyes that see not, and ears which hear not," and Jesus foretold the Pentecostal or Laodicean Church Age would be "blind and know it not," for God has concluded them both in apostasy (Isaiah 6:10; Romans 11:32; Revelation 3:14-22). "When Jesus was in the world the world which was made by the Word knew Him not. He came to His own and His own received Him not. But as many as received the faith were transformed or born again by God's creative Word" for their day (John 1:10-13). Manifest in flesh the Creator said, "The hour is coming, and now is, when the dead shall hear the voice of the Son of God; and they that hear shall live." He spoke of the regeneration of the Church Age saints through understanding the Word for their day and by virtue of His intercession in behalf of their ignorance of its fullness, which ceased "in the days of the Voice of the seventh angel when the Seals were opened and the mystery of God finished" (John 5:19-26). From the day of Pentecost and in each succeeding Age, the evidence of the new birth has been "hearing" with anointed ears what the Spirit was saying to the elect in that Agenot "speaking with tongues of men and of angels" (Acts 2:41; Romans 10:13-21; I Corinthians 13:1; Galatians 3:2; Revelation 2:7, 11, 17, 29; 3:6, 13, 22). How else can we receive God's Word except by the understanding of faith which comes by "hearing" what He is saying? Like Samuel and Elijah we need to be quiet, escape the noise of the world and listen for the still small Voice of inspiration. Notice Jesus has been speaking of the Son of God dispensation. It is essential we recognize Jesus has three Offices: Son of Man, Son of God, and Son of David. In other words, He is Prophet, Priest, and King. To this all denominations agree, but like Israel, the teachers fail to understand that He does not, indeed CANNOT exercise all three offices simultaneously. When the Canaanite woman implored Jesus, "Have mercy on me, O Lord, You Son of David; my daughter is grievously vexed with a demon." He replied, "I am only sent to the lost sheep of the house of Israel." As a Gentile she had no claim on Him as Son of David; besides, His Office then was Son of man the Prophet. Even after the Gentile day of grace Israel will recognize His 'parousia' Coming as Son of man for He will not be crowned Son of David until He restores the Kingdom to Israel in the Millennium (Acts 1:6). However when she persisted, crying: "Lord, help me"; her claim had standing. For He acknowledged He was her Lord, replying: "great is your faith: be it unto you even as you wish. And her daughter was made whole from that very hour" (Matthew 15:21-28)! We must say the right thing to God for there will be no answer if our words are not mixed with faith. For instance, there is no promise of remission of past sins and new birth for those who are baptized in the Titles Father, Son, and Holy Ghost as their testimony is not mixed with faith. Concerning water baptism Peter said, "It is not the washing of the body that saves us, but the answer of a good conscience toward God by the revelation that we are justified by grace through faith without works" (I Peter 3:21). We have no reason to expect an answer from God when we pray in the Titles Father, Son, and Holy Ghost, because Jesus commanded us to pray in His Name, and the Name (singular) of those three Titles is Lord Jesus Christ. When that woman became desperate and said the right thing to God, faith answered her request. Son of Man, Son of God and Son of David are three different and distinct Offices or dispensation claims of one Lord Jesus Christ. This does not make Him three persons anymore than the Titles, Offices, or dispensation claims Father, Son, and Holy Ghost make God three different persons. Three people in one god make three gods or language has lost its meaning, making Christians infidels as the Muslims and "Jews" suppose. These three Titles Father, Son and Holy Ghost refer to God above His people under the Law, God with His people in the days of His flesh and God in His people since Pentecost. Both Isaiah 9:6 and Matthew 28:19 said Messiah would be known by three major Titles, Offices, or dispensation claims: "Wonderful Counselor," the Holy Ghost or parakletos; "Mighty God or Everlasting Father;" and "Prince of Peace" or Son. But the compound redemptive NAME (singular) of these three Titles, Offices, or dispensation claims is Lord Jesus Christ. That is why we baptize, pray, marry, praise, bury, and live in the Name of the Lord Jesus Christ (Acts 2:38-39; 4:12; Colossians 3:17). In the days of His flesh Jesus was not Priest, neither was He Judge, nor King; He was Son of man "the Prophet of Nazareth," the Sacrifice foretold by Moses (Deuteronomy 18:15-18; Matthew 21:11; Hebrews 1:1-2). The Levites were ministers of the earthly sanctuary under the temporary covering of the blood of bulls and goats. There could be no intercession without blood on the Mercy Seat above the Ark in the Holiest which was built after the vision of a pattern God showed Moses on the mount. As Christ Himself was to be the Sacrifice, His precious Blood an atonement and cleansing for sin, He could not possibly have been a Priest in the days of His flesh before His Blood had been shed to cleanse the heavenly tabernacle of the sins of the Old Testament saints, for "without shedding of blood is no remission of sins," thus there could be no priestly ministration and no resurrection of the Old Testament saints prior to Calvary. In the days of His flesh He could hardly have been Judge. Jesus said, "I judge no man . . . I came not to judge but to save the world" (John 8:15; 12:47). Neither was He King but a Prince. He had not overcome (Matthew 26:36-42), and until He completely redeemed the Church Age saints through the centuries in which He was High Priest and Mediator for the elected, and claimed the Book of Redemption or Title Deed to all He had redeemed He could not be King. He could not fully redeem the Church Age saints at Calvary because the Book was sealed and what faith they had would be lost over almost a thousand years of Roman Catholic martyrdom, so He had to intercede for their ignorance or error in the Word. A king has to have a kingdom, Christ had to intercede for His kingdom in order that the Church Age saints could be born into it Spiritually (John 14:1-4; Revelation 1:6; 11:15) and for the non-elect to secure their salvation. Throughout the seven Church Ages His body lay on the sacrifice altar until His Mediatorial Work was finished. Once the last saint predestinated to Laodicea was baptized into the Body the Mercy Seat became a Judgment Seat (Revelation 4), and when the elders advertised for a kinsman redeemer the bloody Lamb advanced from the outer court into the Holy of Holies, took the Book, tore open its Seven Seals, and as Lion of the Tribe of Judah He became King of kings and Judge when the saints crowned Him by their revelation (Revelation 5:8-14). Now there is a Man enthroned in heaven, but Christ's Throne and His Kingdom will be on earth: only then will He be Son of David. It may be helpful if you close your eyes and visualize Revelation 4 and 5 as we rehearse what we have covered thus far. Please study God's Word to prove these things for yourself. From the foundation of the world, the Book was closed and sealed with Seven Seals so that the Church Age saints had only PART-Word. Jewish fables and pagan myths began to be introduced by the non-elect; later the Catholic church was organized in union with the Roman state and martyred over 68 million Christians who refused her creeds. Now, since the Seals have been broken and the mystery of God is finished, the folly of Rome and her harlot (once) Protestant daughter churches is manifest. We now know that Son of man, Son of God, and Son of David are three different Offices, three separate Titles of One Lord Jesus Christ describing His Work in three dispensations over two thousand years and into Eternity. Satan has blinded the eyes of over 99% of churchgoers. Men who have spent a lifetime studying, teaching and writing on Scripture suppose Jesus somehow exercises these three Offices or dispensation claims simultaneously, and make Father, Son, and Holy Ghost three persons. They have not understood that these are three Offices or dispensation claims of the One Person of God, not three persons. They have no understanding of the creation of God in which Jesus is firstborn of many sons (Revelation 3:14). "But without faith it is impossible to please Him" (Hebrews 11:6). Israel has been apostate for two thousand years and knows it not. They worship God in the Office of the Father because they have been struck blind by theology contrary to God's prophetic Word, which they crucified when it manifest in flesh in the Office of Son of man. Jesus said to Israel, "In vain do you worship Me" (Matthew 15:9). The church of this world still worships God in the Office of Son of God, the one Mediator and High Priest between God and men. However, since the opening of the Seals He is no longer a Mediator and has returned in the prophetic Office of Son of man to reveal their mystery. As Son of man He is King of kings and Judge, and has indicted the denominations in this day declaring, "You are naked of the Blood, Spiritually bankrupt, blind to My Word, wretched and miserable; [like Israel] you are apostate and know it not" (John 5:27; Revelation 3:17-20; Romans 11:32). Since the opening of the Seals God has been calling His people out from Rome and her daughters into "the unity of the faith for the manifestation of the Sons of God and the translation" (Matthew 25:6; Revelation 18:4). The Name Jehovah describes God as the self-existent One. Jehovah Jireh describes God as the self-existent One who is your Provider (Genesis 22:13-19; Matthew 14:15-21). Jehovah Nissi describes God as the self-existent One who is your Banner or rallying point (Exodus 17:8-15; Revelation 19:11-16). Jehovah Rapha describes God as the self-existent One who is your Healer (Exodus 15:26; Matthew 4:23). Jehovah Shalom describes God as the self-existent One who is your peace rather than your judge (Judges 6:23-24; Luke 19:38). Jehovah Shammah describes God as the self-existent One who is Present (Ezekiel 48:35; Revelation 21:3, 22). Jehovah Tsidkenu describes God as the self-existent One who is your righteousness (Jeremiah 23:6; Romans 10:4). Neither Israelite nor Christian have at any time considered these seven Titles might be seven gods, or somehow seven persons in one god. Jesus demonstrated each Office proving He is the sole Person of God MANIFEST in virgin-born flesh to redeem Adam's fallen race from sin (I Timothy 3:16). Many other Titles and Offices such as El Shaddaithe all-sufficient One and Jehovah Raahthe Lord is my Shepherd, describe WHAT God is doing at a particular point in time. Jesus means Jehovah-Saviourthe self-existent One is our Saviour. Since the mystery of God is finished, only the spirit of strong delusion in the closing years of the Gentile dispensation could cause Bible students to suppose "Jesus" might be a second or third person of God (Isaiah 45:15, 21-22). When Peter told the assembled multitude, "Let all the house of Israel know assuredly, God has made that same Jesus, whom you have crucified, both Lord and Christ," their conscience was pricked, and they implored Peter and the rest of the apostles, "Men and brethren, we've killed the very Messiah, what must we do to be saved"? Then Peter said to them, "Every one of you must repent, and be baptized in the Name of our Lord Jesus Christ for the remission of sins, and you shall receive the gift of the Holy Ghost. For the promise is to you [Israelites], and to your [Hebrew] children, and to all that are afar off [we Gentiles], even as many as the Lord our God shall ever call [both Israelites and Gentiles]" (Acts 2:36-39). God's compound redemptive Name is Lord Jesus Christ, "Neither is there salvation in any other: for there is no other name under heaven given among men whereby we must be saved" (Acts 4:12). God is our One and only Saviour, beside Him there is no other. Were people to truly acknowledge Jesus is EmmanuelGOD with usthey would see that these Titles or Offices describe the work in which He is engaged at a particular point in time. God hides in humility and reveals Himself in simplicity such that "even the most stupid traveler who enters the road that leads to Life shall not err in the way of righteousness" (Isaiah 35:8). In John's Gospel Jesus explained to His disciples that while He was with them physically, the time would come when the world would see Him no more, but they would not be without consolation. "I will return in another form, and at that day you will know I am WITH you, and also IN you". This promise began its fulfillment on the Day of Pentecost when He returned in Spirit form. In the form of flesh He could be present only so long as His disciples were gathered together in one location. But as Son of God, the Holy Spirit could be with and IN every one of His saints in Spirit form, wherever they were 24 hours a day, through faith or understanding of the Word (John 14; Galatians 3:2,14; I Peter 1:22-25; I John 3:9). As Son of God He was Mediator between God and men from Pentecost to the end of the Laodicean Church Age. When Revelation 4 and 5 were fulfilled He answered the call for a Kinsman Redeemer, claimed the Title Deed to everything Adam had forfeited and tore open the Seven Seals, revealing HOW He had redeemed the New Testament saints in each Age. In Matthew 24:36, Jesus told His disciples there were many things even He did not know, and in Acts 1:6-8 He said it was not needful at that time for them to know when the Millennium should commence, for the Gospel must first be witnessed to the Gentiles before the kingdom is restored to Israel. Thirty years later He signified the future two thousand years of Church history to John on the Isle of Patmos, instructing him NOT to write the Seventh Seal, which is the revelation of the previous Six Seals disclosed by the voices of the seven thunders of Revelation 10:3-4. Thunder represents the Voice of God which spoke through each of the seven Church Age Messengers (John 12:27-29). From the first three chapters of Revelation we learn Jesus did not immediately reveal all things to the early Church. Pentecost received the most important of all revelationsthat of the Supreme Deity of our Lord Jesus Christ, which would be buried in martyrdom and Roman dogmabut the mystery of God and future Church history was sealed to the time of the end. God anointed seven major apostles with seven different measures of the Spirit to deliver a portion of His Word to the saints of each Age. The "letter" to each of these "angels" was a prophetic Message for the churches of each dispensation. The elect Church received what the Spirit was revealing for their Age and were born-again when they "heard the Voice of the Son of God," while the nominal church without faith to "hear" came under condemnation by the "letter" only (John 6:24). This confirms our understanding of John 5:24-26: "The hour is coming and now is, when those dead in sin and trespasses shall hear the Voice of the Son of God: and they that hear shall live. For as the Father has Life in Himself; so has He given to the Son to have Life in Himself." From Pentecost to Laodicea, it was the revelation of the Voice of the Son of God that baptized the saints into the Body, receiving their revelation of the Word for their day, and interceding for their ignorance of "that which was in part". Our FIRST birth brought us into the world physically; spiritually we were born dead in sins (Psalm 51:5; Ephesians 2:6). Jesus said, "My elect hear My Voice, and a stranger they will not follow . . . And all the Father has given Me will come." Only the elect can receive the Word for their Age. Throughout the Church Ages Christ was in the Office of Son of God as Mediator, Priest or Advocate, interceding for the ignorance of the fullness of the Word so the elect from Pentecost to Laodicea could be born again. He interceded for the Israelite majority during the first three Church Ages on account of "Jewish fables and commandments of men that turn from the truth"; the Judaeo-Roman FALSE church that organized in AD325 martyred millions of Christians to enforce her dogma so that the pure faith was lost and He interceded for the ignorance of the Gentile majority of the final four Ages. Like Israel the Church Ages ended in apostasy, but God promised to RESTORE the apostolic faith and finish the mystery of God in the "the shortening of days" (Matthew 24:22)this holy convocation of His Supernatural unseen second Coming in W_O_R_D form. (The Greek word for this Coming is 'parousia,' meaning His 'arrival and subsequent Presence' and not His second physical return). Jesus said He would build His Church on the rock of Spiritual revelation of the Word which is faith (Matthew 16:13-20), so this RESTORATION was necessary because the Church Age saints cannot be glorified until we come into the unity of the faith for the manifestation of the Sons of God. As the Word of God comes only to a vindicated prophet, the seventh angel of Revelation 10:7 was "Elijah the Prophet" of Malachi 4:5-6. "Behold I will send you Elijah the prophet before the coming of the great and dreadful day of the Lord; and he [John the Baptist] shall turn the hearts of the apostolic fathers to the elect children, [the Pentecostal saints who were the fruit of John the Baptist's ministry three years after Jesus' death (Malachi 3:1)], and the heart of the elect children to their apostolic fathers, [whose faith Brother Branham restored to Christ's end-time Bride (Matthew 17:11)] lest I come and smite the earth with a curse" (Malachi 4:5-6). "But in the days of the Voice of the seventh angel, when he shall begin to sound, the mystery of God should be finished, as He has declared to His servants the prophets" (Revelation 10:7). The second Coming is Christ the fullness of the anointed W_O_R_D, NOT the glorified Man from Galilee. The revelation of the Seven Seals "finished the mystery of God" and introduced "that which is perfect [or complete]" (I Corinthians 13:10)Christ the fullness through the mouth of His Prophet, and like Israel the churches rejected Him in unbelief because they were looking for the M_A_N, which will be His THIRD Coming. How can they receive Christ without faith in His Word? They love their illusion of the historical Jesus but despise His unchanging Word because it condemns their sin. Those who cannot receive the Word of God are not His children (John 10:1-5; Romans 8:6-8; II Corinthians 4:3; Hebrews 12:8). On Mount Transfiguration Jesus showed Peter, James and John a vision of the order of His second or 'parousia' Coming to Israel preceded by 'Moses' and 'Elijah.' Three witnesses represent the 144,000 elect Israelites, while the two witnesses who reconfirm the New Covenant represent the resurrected and translated New Testament saints seen with Jesus as His Wife (Zechariah 4; Revelation 11; II Corinthians 13:1; Daniel 9:27; Matthew 16:27  17:13; Revelation 19:5-18). Following the martyrdom of the two witnesses Israel will recognize Christ's second or 'parousia' Coming. His third Coming or second physical return will not take place until after the consummation, when together with the saints of all Ages He steps out on the ashes of the wicked for the Millennium (Malachi 4:1-3). When Peter asked when the Elijah of Malachi 4:5-6 should come, Jesus replied, "This Elijah shall come at the end of the Gentile dispensation before the vision you have just seen comes to pass, and he will restore all things which God has spoken by the mouth of all His holy prophets since the world began. Before I return to Israel, faith in the Word, which will be compromised through the Church Ages, must be RESTORED to perfect the Gentile Bride for the manifestation the Sons of God and the Resurrection." Jesus then identified John the Baptist as the Elijah of Malachi 3:1 who had already fulfilled his part of the Scripture and sealed his testimony with his own life (Matthew 17:1-13; Acts 3:21). The Elijah of Malachi 4:5-6, William Branham (1909-1965), did not preach another gospel, for there is only one; nor did he add to Scripture. His ministry is clearly described by Joel, Malachi, Matthew and Revelation as restoring "the" one and only faith once delivered to the saints, and revealing the hidden mystery of the six written Seals by the spoken Word of the unwritten Seventh Seal (Revelation 8:1). His Commission was to gather all the loose ends of doctrine not completely understood by the Reformers and reveal the history of the Seven Church Ages concealed under symbols in the Book of Revelation. As Christ was the only one "worthy to read the Book or even to look thereon," this could only occur once the last saint predestinated to the Seventh Church Age was redeemed or baptized into the Body, thus fulfilling His ministry of Mediation. Can you see that Revelation 4 and 5 could not be fulfilled until all Seven Church Ages had come to pass? Once the Church Ages were over, and they are, Christ opened the Book which has been sealed from the foundation of the world and revealed the perfect interpretation to the "angel" of the Seventh Church Age who delivered the full Counsel of God to His Church (Revelation 1:1; 3:14; 10:7). Because the Word has been sealed with Seven Seals, the New Testament saints through the Ages had only "part" of Christ the anointed Word. Now since the Seals are open and the mystery is revealed, Christ is here and we have the perfect interpretation of the Word. I Corinthians 13:10 is fulfilled: "When that which is perfect is come, then that which is in part shall be done away." There is only One "Perfect," which is Christ the Word, and the Word comes only to a prophet. So "a" son of man, the earthly angel to the Laodicean Church Age revealed "the" Son of man, Christ the fullness of the Word. The Son of man is not "part" of the Word, He is the complete Word. Jesus is not a second or third "part" of God, He IS Emmanuelthe fullness of God with us. So in rejecting the seventh angel's Message the churches ALL rejected Christ, fulfilling Revelation 3:20, crucifying unto themselves the Son of God afresh, and they know it not. Do you begin to understand more clearly how we have shown that the second Coming was NOT the Word in the physical form of Jesus; neither was it Spirit in the Office of the Son of God. He came in the form of the SPOKEN WORD of the unwritten Seventh Seal, the mystery of the voices of the Seven Thunders John was forbidden to write, which is the Message of God's Prophet revealing the Son of man again. "But Brother, what about Zechariah 14:4, 'His feet shall stand in that day upon the mount of Olives . . .?'" His precious feet will not touch this earth until the Millennium. "Blessed are they that have not seen, yet have believed." That is a symbol for Israel as Revelation 10:1-4 is a symbol to us Gentiles. The second Coming is Spiritual, it is the Word in the Office of "Son of man," uniting with His Bride to fulfill John 17:21-23 and Ephesians 4:13 for the manifestation of the Sons of God. His THIRD Coming (or second physical return) will be the flesh Man in the Office of Son of David. All four Gospels speak of the 'parousia' "Coming of the Son of man," and of the "revealing" (Greek 'apokalupsis,' meaning disclosure) of the Son of man at the end of the Gentile dispensation. None of these prophesies refer to the physical return of the Man Jesus. The physical Coming takes place when He steps out on the ashes of the wicked after ALL life has been destroyed. The second physical Coming is when He leaves His Father's Throne in heaven to take up His Own Throne on earth for the millennium in the Office of Son of David when the kingdom of Israel is restored (Revelation 3:21). The second Coming at the end of the Gentile dispensation is not the Man from Galilee but Christ the Word, veiled behind a vindicated prophet revealing Jesus Christ the same yesterday, and today, and forever, by the unmistakable Messianic sign of Hebrews 4:12: "discerning the thoughts and intents of the heart . . . as it was in the days of Lot" just before the Gentile cities of Sodom and Gomorrah were destroyed. Through this ministry God raised the dead, restored sight to the blind, and performed more miracles than recorded in all the Bible, proving Jesus lives (John 14:12). Just as there is no Trinity but One God with three Offices or dispensation claims, can you see it is not a second or third Christ but the SAME Jesus who returns at the end of the Gentile dispensation in another form with another Title, Office or dispensation claim before Fire falls and destroys this Gentile civilization? Like Israel, the church proves it is not following the Word when it fails to recognize He is no longer a Mediator in the Office of Son of God but has returned as Son of man; it is following its own ideas instead of the Word. He came as Son of Man to redeem His Bride, Son of God to intercede for the Church Age saints, Son of Man to incarnate the living saints with the fullness of the Word in the Rapture and will return with His saints as Son of David for the Millennium. John 5:26-28, "As the Father has Life in Himself; so has He given the Son to have Life in Himself; and has given Him authority to execute judgment also, because He is the Son of man. Marvel not at this; for the hour is coming, in which all that are in the graves shall hear His Voice, and . . ." Jesus goes on to speak of the general resurrection and White Throne Judgment after the millennium. But do you see that at the end of the Age He is no longer Son of God, Mediator and Priest? Once He had redeemed the PART-Word saints He took the Office Son of man and came back as Light on the Word to bring His end-time Bride into perfect oneness and indict the world. Now He is King of kings and Judge. Once the Seven Seals were revealed, Christ was no longer mediating for ignorance. As on Mount Sinai, once the full Word or Commandment was delivered He became Judge (John 5:27; Romans 4:15; 5:13; I Corinthians 13:10; Revelation 4:5). Christ had to return to His prophetic Office in order to restore the apostolic faith, reveal the Seals, indict the world of sin, then execute Judgment under the Sixth Seal and Seventh Trumpet, reconfirm His new Covenant to Israel and reveal Himself the same yesterday, and today, and forever through their two witnesses. II Timothy 3 and 4 foretell end-time conditions in society and the church. Daniel was told to seal the vision and prophecy until the time of the END, so the end-time commenced in 1963 when Christ opened the Seven Seals. The Gospels also foretell the lawlessness of the end timeas in the days of the Judges of Israel every man does what he deems right in his own sight with no regard to God or His Word. Jesus described the Coming of the Son of man as "lightning" in a hypocritical day that is "neither light nor dark . . . lukewarm, and neither cold nor hot,"a time of lawlessness with no Absolute, no right or wrongbut "in the evening time [just before the end of the Gentile dispensation and total apostasy] it will be Light." When Paul met Him on the Damascus Road He was Light. He has returned in this end time as the Light of seven daysthe Fullness of the revelation (Luke 17:22-24; Isaiah 30:26; Zechariah 14:7; Revelation 10:1-7). God is Light, the second Coming is not a Man but Light; the same Light of revelation which shone in the East in the morning of the Gospel has restored the same faith in the West as a witness against the Christ-rejecting Gentiles (Matthew 24:27). The unveiling of the Seventh Seal brought Christ back to earth in W_O_R_D form. Continuing His prophecy, Jesus likened the days of the Son of man to the days of Noah, inviting us to compare current conditions with those that caused God to grieve forming man in flesh. Rather than taking dominion over animals, his flesh, animal, took dominion over man through lust (Genesis 6:3). The sons of Adam immorally cohabited and interbred with the daughters of Cain. God never forgave this sin and destroyed the world. Jesus said miscegenation between the seed of the Serpent and the seed of Adam would repeat at the end of the Gentile dispensation and foretold the advances we see in science and engineering, increasing population and city building, "and as it was in the days of Noah so will the Coming of the Son of man be" (Matthew 24:37). As Enoch's translation, Noah's deliverance and the consummation of life vindicated their Message. The translation of the Bride and consummation of life will be the vindication of Brother Branham's end-time Message. Despite the warnings and preaching, there is no repentance and the world will continue in sin until atomic fire destroys them all. Jesus also compared end-time conditions with Sodom and Gomorrah (Luke 17:28-37) and promised the Son of man will be revealed to Abraham's royal Seed, called-out and separated from the world. From this type in Genesis 18, we learn the Church will receive no further witnesses after the prophet of Malachi 4:5-6. Veiled behind the flesh of a created man God revealed the secrets of Abraham and Sarah's hearts, proving He was the Word (Hebrews 4:12). Veiled behind the flesh of the virgin-born Jesus He identified Himself by the same sign at the end of the Law when Israel was apostate and knew it not. As He is no respecter of persons He promised to reveal Himself by the same sign at the end of the Gentile Age when the church is apostate and knows it not. Homosexuality now is rampant and openly accepted as it was in the days of Lot, and three messengers have visited: the last messenger to our dispensation was the angel with a prophetic ministry of restoration to call the elect out of the Seventh Church Age into the holy convocation of the fiftieth day of the antitype of Israel's Pentecostal feast while two others ministered a basic salvation Message to the nominal church in Sodom. God has declared Himself to His elect at the end of the Gentile dispensation veiled behind the flesh of the prophet William Branhama sinner saved by gracerevealing Jesus Christ the same yesterday, and today, and forever by discerning the thoughts and intents of the heart. He finished the mystery of God from the Serpent seed in the Garden of Eden to Satan's incarnation in that man of sin when Satan is cast down to earth, and restored the apostolic faith. The denominations in Sodom also received their messengersBilly Graham and Oral Roberts. 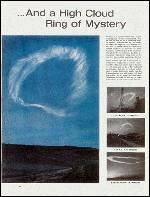 Christ's 'parousia' Coming was signified in the heavens by a mysterious cloud above Tucson Arizona on February 28, 1963. A hundred and fifty independent photographs were taken, many of which appeared in newspapers and magazines around the world. Scientific articles were published in encyclopedias and books on meteorology (Daniel 7:9; Matthew 24:29-30; Acts 1:9-11; Revelation 1:7). God revealed this to Brother Branham by vision several months before the phenomenon. This Cloud was miles above the atmosphere where there is no moisture, this was no natural cloud but a Supernatural Light scientists have to this day been unable to explain. The Son of man was revealed or made known through the ministry of William Branham by the same signs which vindicated Him in the days of His flesh. The dead were raised on many occasions, the blind received sight, the deaf heard and the lame walked. This was not done in secret but before congregations of half a million. Following one meeting in Durban South Africa, the council removed seven truck loads of discarded cots, wheelchairs, crutches and similar aids from the meeting place, the second largest race track in the world and the only venue that could accommodate the numbers. God has always veiled Himself behind the flesh of men. Jesus was sent to declare the Father, not to make Himself known (John 1:18), and Brother Branham was sent to reveal the Son of man, not to promote himself. Not once did the sign of Hebrews 4:12 fail to reveal Christ in the Office of the Son of man, the same yesterday, and today, and forever. Actions speak louder than words. Denominational people say, "We're looking for the Coming of Christ." But their actions prove otherwise and they are looking for the wrong thing. But there is a people as Jesus described in Luke 17:30-37, one here and one there who are looking for the Coming of the Lord, and these verses speak of His end-time Bride being called out of "her," the church, into "Him," the Word by the "shout, and the Voice of the Archangel." He only reveals Himself to those with faith to understand. Only the elect are called out of dead creed and tradition to gather around the carcass of the Living Body Word of the Lord Jesus and be caught into a channel of revelation like Job. When the inspiration struck his heart he said, "I know that my Redeemer lives, and He shall stand in the latter day upon the earth. And though after my skin worms destroy this body, yet in my flesh I shall see God" (Job 19:25-26). Noah, Job, Abraham, the woman at the well and saints in every age "saw God" when His promised Word was vindicated. Today, God is calling His people out from every denomination into oneness with the Word for the manifestation of the sons of God. Before we can come into Christ the Word, we must come out of the Babel of denominational confusionfor how can two walk together except they are agreed on the Word (Amos 3:3)? Christ is not uniting with a denominational harlot; she is going to be burned. Christ is marrying a pure virgin without spot or blemish. He's gathering His people for the translation, two are in a bedor church, a spiritual resting placeHe'll take one and leave one, two are working in the mission fields, He'll take one and leave one, two are grindingpreparing to preach the Bread of Life, He'll take one and leave one. Where is He going to take them? He will take them to where the eagles are gathered together around the fresh Word of this Message, which is Jesus Christ. The denominations believe these verses speak of the physical resurrection from the grave but they speak of the Spiritual resurrection or new birth of Christ's end-time Bride. Do you believe the God who promised these things has done them? You do if you're a Bible Believer, not a denominational. The old Methodists, Baptists, and genuine Pentecostals of those Ages longed to see these things. We believe the Word was made flesh in the days of the Gospel. And we see the Word made flesh in His promise today. Men and women, can you see how close we are to the going away? You who've put off the Baptism of the Holy Ghost, perhaps relying upon some sensation, the assurances of some old minister, or trusting some gift you have that Satan can impersonate, yet lack the real Spirit in you to go all the way in God's promises. How can a man who claims to have the Holy Ghost deny one Word of this Bible being "not right?" He can't do it! No matter how religious you are and how many churches you belong to, if that genuine Holy Ghost is in you (which is this Word manifest) you will see the Message and the hour, because it's the Holy Ghost that does it. But the inspiration has to quicken it to you. No matter how much water you pour water on the ground, if no seed has been planted there is nothing to bring forth. The elect of God saw it in Noah's day, Moses' day, Jesus' day, the apostolic day, Luther's day, Wesley's day, and in the Pentecostal Age, because they were foreknown as being on the earth when the inspiration was poured out for their day. Now while the inspiration is being poured out to gather the Bride together, only the elect will see it. Jesus said, "I thank You, Father that You have hidden these things from the wise and prudent and revealed them to babes as will learn". Once inspiration strikes and you have the revelation, the gates of hell cannot prevail against it. Are we living in a modern Sodom and Gomorrah? Is history repeating itself? It was a Gentile world that was destroyed by fire then. Jesus said in Luke 17:28-30, "As it was in the days of Sodom, so shall it be when the Son of man is being revealed" or made known! John the Baptist, Malachi, Jesus and Peter said, "The heavens and the earth which are now are reserved for fire" (II Peter 3:7). Things that were hidden throughout the Church Ages are now revealed. God promised it and if He doesn't honor His Word It's no better than a man's. He is His Own interpreter. He said, "A virgin shall conceive," and she did. He said, "Let there be light," and there was. We are not living in Luther's Age, Wesley's Age, or the Pentecostal Age; we live in the evening time when the Bride is being called out. Jesus said He would return as Son of man in this day and He has. He is here NOW; Christ is here in WORD Form. It was hard for Catholics to see Luther; for Luther's followers to see Wesley's dispensation, and for Wesley's group to see the Pentecostal Age. Now it is hard for the Pentecostals to see OUR day. And if it's hard for the Pentecostals, it is almost impossible for the Baptist, Methodist, Anglican and other denominations two or three dispensations behind God's Word to come out of Babylon into the glorious Light of the present Truth. It has always been this way because the Spirit is poured out for an elected Seed and that only. The others can't see it. Revelation foretold Christ would be put out of the church in the Laodicean Church Age, and He was because they are "naked, poor, miserable, blind and know it not". Before the foundation of the world Jesus said "Let there be," and there was. "He was in the world, and the world was made by Him, and the world knew Him not. But as many as did know Him, to them he gave the power to become the Sons of God." The very Creator Himself later said, "Marvel not at this; for the hour is coming when all that are in the grave will hear the Voice of the Son of man, and shall come forth." The very God who said "Let there be Light," said "The Voice of the Son of man would wake those that are in the grave." It has to happen in its season. Now He is Son of man, not Son of God. He is the same Person in a different Office for a different work. The Son of Man is the W_O_R_D: the Seventh Angel's Message is the Son of manRevelation 10:1-7. In Revelation 1, which is the end of the Age, we see one like the Son of man standing in the midst of the seven lampstands. The symbol is likened to the Son of man as Judge, girt about the breast with a golden girdle, not as Son of God and Mediator, and symbolizes the elect Church drawn out of all Ages. This is Jesusimpersonated in the flesh of His Church. I Corinthians 6:2, "Don't you know that the saints will judge the world"? The finished Body has grown into the measure of the stature of a perfect Man, the Fullness of the Word, fulfilling Malachi 4 and other Scriptures that promised a restoration of the Word in this day. The Bride and Groom will be one when the Seventh Trumpet sounds the fullness of the Gentiles and announces the great and dreadful day of the Lord. Jesus came as Son of man to redeem His Bride, as Son of God to mediate for His Bride while the Book was sealed, and is again Son of Manthe fullness of the Word uniting with His Bride for the resurrection, the manifestation of the sons of God and the translation. He will return with the saints of all Ages for the Millennium, in the Office of Son of David. Once again, God bless you Brethren as you receive this Word with all readiness of mind and then search the Scriptures. Like Job, we are in the hour of crisis. If you have a genuine revelation like Job, you will hold to it although friends and family scoff and scorn your Jesus. If the church rejects this revelation because it condemns their creeds, they will reject the Word in you because the Life of Christ on display brings them into condemnation.